Film Archive Contact Commercial Portfolio Instagram Create PDF Projects/Brazil Incarnate Projects/Egypt - Tomb robbers Projects/Japan - Double life of a Shinto priest Projects/Brazil – The Beautiful Game Projects/Pakistan – Mad about cricket Projects/India – A day in the life Projects/China – A day in the life Projects/Bolivia – Bach in the bush Projects/Spain - The slaves of the sea Projects/Latin America – Pain and Hope Projects/Cuba – a road trip Projects/Argentina – The Mille Miglia car rally Projects/The Vatican - a day in the life Projects/Argentina - Gauchos Projects/Argentina - The Last Tango About Projects/Niger - Peace seeker in the desert Projects/Italy - Gladiator Football Projects/Brazil – Under Christ’s Shadow Books/Brazil - The Beautiful Game Books/The Vatican - Secrets and Treasure of the Holy City Books/India - People, Place, Culture, History Books/China - People, Place, Culture, History Books/Brazil Incarnate Books/The Silence of the Silver River Books/Body Culture in Brazil Projects/Chile - Papageno in Paradise Projects/Chile - The Mapuche and their "King"
Florence's infamous Calcio Storico, also known as Gladiator Football. It takes place over two weekends in Piazza Santa Croce. A bone crunching experience for both 27 men teams, where all tactics are allowed to get the ball to the oppositions goal. 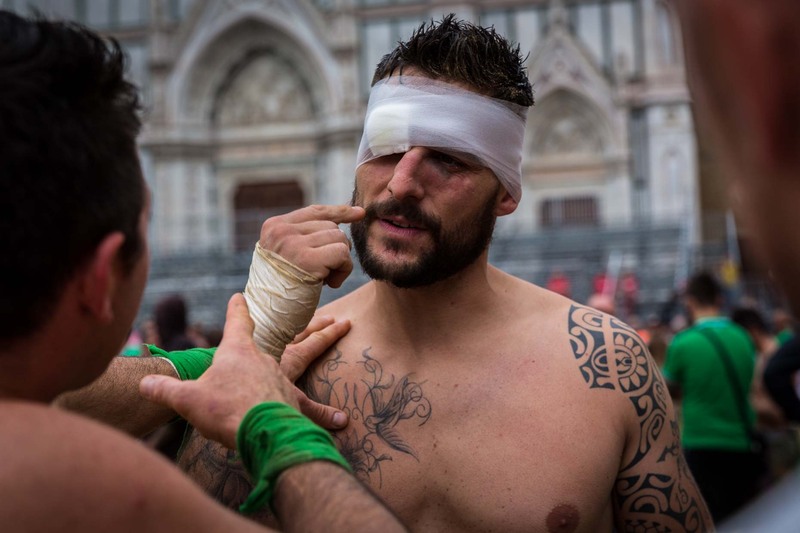 The Verdi team lick their wounds and loss, Italy.